The writer, artist, and creator of Techgal, a web based comic book. He also works under the stage name Timothy James as a professional magician, making regular appearances on cruise ships and at comedy clubs across the country. 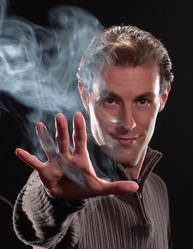 He has won numerous awards for sleight of hand including the Lance Burton Award of Excellence at the World Magic Seminar in Las Vegas.